More than 70 years ago, James Webb Young, who had started at J. Walter Thompson as a copywriter before WWI and who became a professor of business history at the University of Chicago’s School of Business in 1931 (while still working at JWT), wrote “A Technique for Producing Ideas” to explore just that question. To dig into the process that was – and hopefully still is – at the center of the advertising business. So what makes it so damn great? Well for one thing, it’s really short. Crazy short. Forty-eight pages short. Add two more pages for Bernbach’s 1965 introduction, and another two or so to Reinhard’s and we’re barely breaking fifty. Plus the type is big and the leading is open and airy. In fact, it’s so slight that anyone who’s ever had to produce ideas on a regular basis might scoff at it. How can a book that discusses something so difficult and so important be so puny? It should instead be enormous and should trumpet its importance like the Bible or the Federal Budget or the phonebook. It should be filled with charts and graphs and illustrations that make the complicated high-wire fire-drill we go through understandable – and appreciated! – by our friends and family and bill collectors. But its none of those things. It’s a slim volume that offers some very common sense ideas and insights. Now, some people complain that it’s only common sense. That any creative worth their cab fare already knows how to do the things Young discusses here. And there’s some merit to those comments. Young talks about “combinations”. He talks about “old elements”. About “mental digesting”. He talks a lot about time, about giving yourself the time to think about – and not think about – what you’re working on. And yes, I am willing to concede that if you’re in this business and are any good at it, and have spent any time trying to come up with good ideas day after day that you’ve invariably tried all of these things – in some form or another. But frankly identifying the essential characteristics of concepting is only part of the value of this remarkable little book. The far greater importance is that reading it makes you think about your own process. Whatever you think of Young, he clearly has taken his own approach apart in order to see how it works. And we hate to do that, don’t we? We hate it because we’re afraid that if we do it, we’ll stop being able to concept. That the magic will have been sucked out of it. That we will have made the gods angry. But analysis is important. Not to take the magic out and make the process more mechanical – and therefore less terrifying (although some days, that would be nice). Not at all. Because I believe – and I think probably Young and Bernbach and Reinhard believe as well – that you will never make creativity an efficient process. But I do believe you can always make it efficient-er. And I would bet those esteemed members of the Advertising Hall of Fame believed it, too. Analyze your process and you can learn how you think about things – to see if that’s the only way (spoiler alert: it probably isn’t). You can learn what tricks you use, and see if other tricks will work too. Heck, you can even use what you’ve learned to help get you on track when the ideas and words and images just won’t come. Or you can just pick up this clever little book and remind yourself of what you already know. You’ll be amazed at how useful that is too. 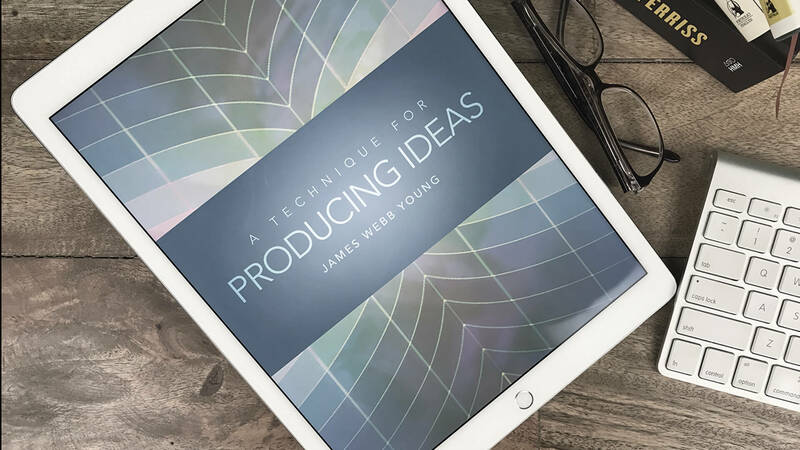 This edition of A Technique for Producing Ideas by James Webb Young, originally published in 1939, and republished in 1965, was most recently published by McGraw-Hill on 1/21/03.